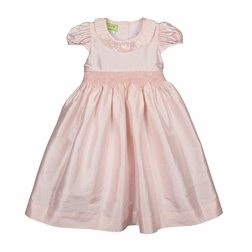 An absolutely lovely smooth and soft pink silk dress by Le' Za Me for older girls. The dress has short sleeves and is smocked at the waist. The smocking is embroidered with geometric designs and pink bullions. The dress has two wide sashes that tie into a big, fluffy bow in the back. 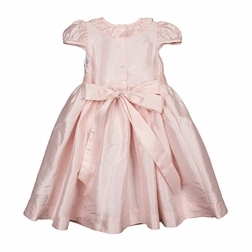 Perfect for portraits, flower girls and other special occasions.